Have you ever seen a pair of gigantic waraji (草鞋: straw sandals) leaning against the main gate of a Buddhist temple? Some are more than two meters tall! Who made them and why are they are there? According to some temple priests, it seems that local people, either children or adults, wove and donated them to the temple to protect the temple, to ward off evil spirits, to bring happiness, and so that people will have healthy legs and feet. 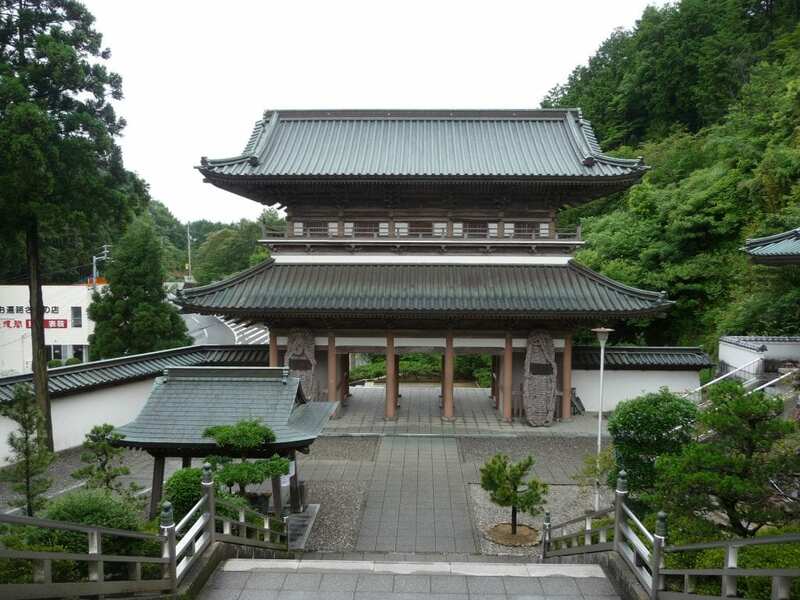 These gigantic sandals are placed beside the Niōmon gate because it is said that the two Niō statues standing guard on each side of the gate have strong legs so people will pray to them so that they will have not have any leg or feet problems. Others, as a sign of thanks after a successful journey, will attach a pair of regular or mini-sized waraji to the giant one. Looking at these waraji makes one realize that in the past travellers in Japan, including henro (pilgrims) along the Shikoku pilgrimage route, had to use such uncomfortable-looking, fragile footwear. What would it be like to walk in such and how long would they last? A festival participant adds a finishing touch to a pair of straw sandals. 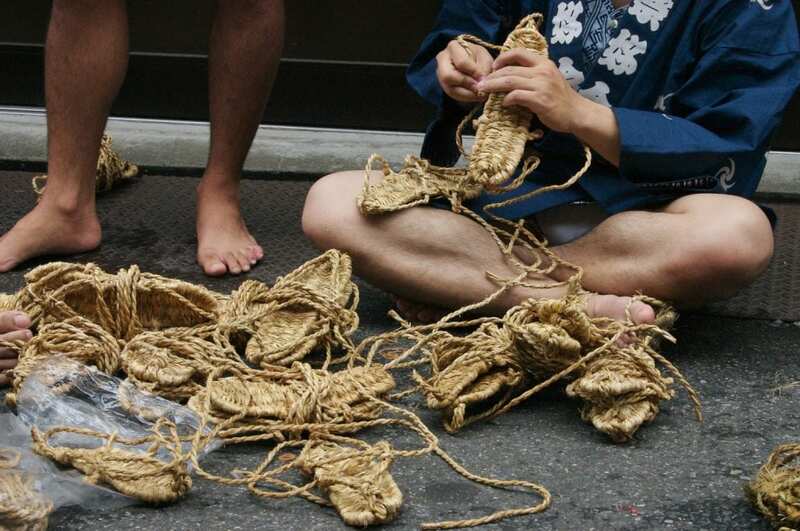 These ‘half-sandals’ are called ashinaka (足半) and were on average 15-19 cm in length. In fact, they have a long history in Japan, with the first pictorial proof of their existence from 1293 or 1309 and the first reference in a document about them occurring between 1394 and 1427! Ashinaka seemed to be convenient when running because they kept you on your toes and were used between the Kamakura and Sengoku periods in times of battle. By the Edō period, the popularity of ashinaka had spread to the common people, such as farmers, who were also now wearing them. These ashinaka were also given the name of ‘sandals that could ward off snakes’ (Mamushi yoke zōri 蝮除け草履) and were believed to have been invented by Kōbō Daishi. Such sandals would protect one’s feet from being bitten by poisonous snakes (mamushi) or insects when travelling through the mountains. There were other beliefs that ashinaka would ward off bad spirits and protect one from fever and illnesses such as whooping cough. Many people wore ashinaka because they believed that Kōbō Daishi had worn them when he walked the pilgrimage. However, in other instances, instead of wearing them, people would make a miniature pair and carry them it seems when going on pilgrimages as a remembrance of Kōbō Daishi. Thus not only did these sandals have numerous practical advantages, but they were also closely connected to the belief in legendary figure of Kōbō Daishi. Over time, people stopped wearing ashinaka and began to wear full-length waraji. It is difficult to determine exactly when the switch occurred, but pictures of pilgrims from different eras offer some clue and it is clear that by the Bunsei period (1804-1830) ashinaka were no longer used. For example, a travel record from 1819 states that there were people who came from the eastern part of present-day Hiroshima prefecture to give away money and waraji. A book from 1825 states, “On pine trees along the pilgrimage path throughout Shikoku waraji are hung and dango (sweet, round dumplings made from rice flour) are put on a tray. If you take a dango, you are to put two mon of money in the container.” Then, about a hundred years later in 1927, Alfred Bohner includes a photo of an unmanned waraji stall in his book, “Two on a Pilgrimage.” Here you can see two pilgrims from Hokkaido standing in front of the stall and next to a row of waraji there is a bamboo pipe, on which the price of five sen is written. As in 1825 a pilgrim would put money into the pipe, take a new pair of waraji, and continue on his journey. It would be interesting to see how someone faired trying to walk the Shikoku pilgrimage route in ashinaka or waraji today. This article was first published in the November 2015 issue of Awa Life.